TEHRAN, Iran (CNN) -- Iran's three top reformist leaders are calling for an end to the "security atmosphere" in the country, referring to what they say is the government's heavy-handed response to those who protested the results of last month's presidential election. 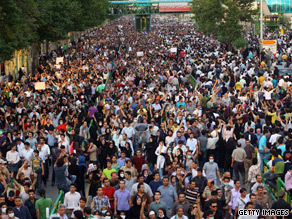 Protests by Iranians, such as this one on June 15, have been defended by the reformist figures. "The wave of useless arrests must stop immediately, and those arrested previously and have not committed any crimes must be freed immediately, and security forces must return to their barracks," said a statement from Mir Hossein Moussavi, Mehdi Karrubi and Mohammad Khatami following their meeting on Monday. Massive protests rocked Iran in the days following the June 12 election, which incumbent President Mahmoud Ahmadinejad won by a landslide. The widespread street demonstrations and civil unrest led to the deaths of at least 20 protesters and the arrest of more than 1,000, according to Iranian state-run media. The numbers of casualties and arrests could not be independently verified by CNN because the Iranian government has banned international journalists. The comments of Moussavi, the leading opposition candidate; Karrubi, another candidate; and Khatami, a former Iranian president, were posted on Moussavi's Web site, GhalamNews.ir. The men have questioned the legitimacy of the vote, and accused the government of fraud in the election results. They agreed that discontented Iranians' only crime was "their protest against the cheating during the election," according to the Web site.